On July 28th 1914, Austria declared war on Serbia following the assassination of Archduke Franz Ferdinand by a Serbian nationalist. As Russia mobilised, Germany declared war on Russia and France, invading neutral Belgium and Luxembourg on the way to France. As a result, Britain declared war on Germany on August 4th and so began over four years of fighting which had a devastating effect on many people, changing the world forever. "Looking back to the end of last term, we remember that every prospect seemed good this year; there was no hint of the trouble to come. With four Blues and six May colours intending to be in residence, we looked forward with confidence to great happenings, whilst a fair crop of academic distinction seemed probable. But it was not to be. In August the call came, and the call was answered...One by one the rest came up; in little groups we foregathered, discussing the all-compelling topic, and watching to see who would be with us, and who would not. But those who came up were few; on every hand, we miss the wonted number of our friends. Daily we are reminded of them in untenanted room and silent stair, and the empty seats in Hall speak eloquently of their numbers. So many have gone, so many of those whom the College could ill spare; and still others go. Our thoughts are of them, and, whether on the field of battle, or bearing their part still near at home, our good wishes go with them." 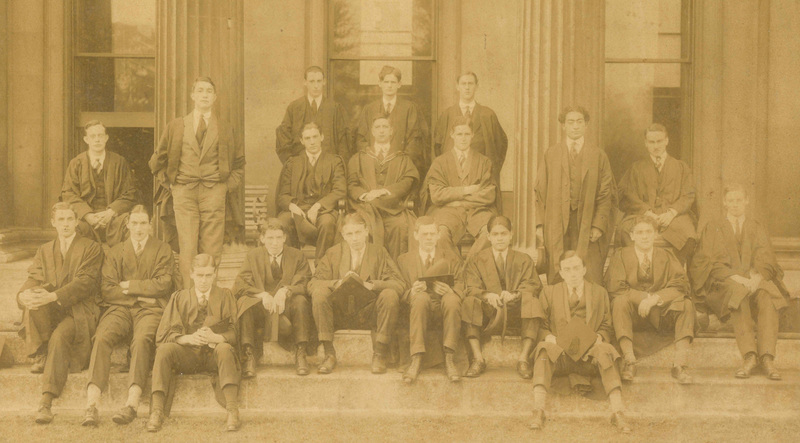 Twenty students matriculated in 1914. Some of those who had been offered places - including Lionel Whitby (who would return to Downing after military service in 1918 and later became its Master in 1947) - did not matriculate, instead volunteering immediately for military service on the outbreak of war. Of those who did begin their courses at Downing in 1914, most would go on to serve in some capacity: eighteen served in the Forces, of whom five were wounded, and three students would sadly not return from the war at all. (For those who did enlist before the completion of their degrees, students were allowed to claim three additional terms in lieu of military service, so could graduate after completing six terms of residence). Those who remained in College generally joined the Officer Training Corps and, in 1916, new Officer Cadet Battalions were introduced across the country, providing a compulsory four month intensive course to improve the training given to new officers. Three of the national OCBs were based in Cambridge and Downing and Peterhouse were home to 'E' Company of No.2 OCB, run from Pembroke College. As a result, some of those who were resident in Downing during the war were not necessarily undergraduates at the College. Numbers of actual students understandably dropped as the war continued - The Griffin, Lent 1917, reported 'There are sixteen in residence this term: we shudder when we contemplate the next.' That Autumn, just eight new students matriculated, including several medics. By January 1917, over half of the country's qualified doctors had been called up and, amidst growing concerns about the loss of doctors in military service and the continued need for doctors to replace them and provide care for the civilian population, medical students were exempt from military service from early 1918. 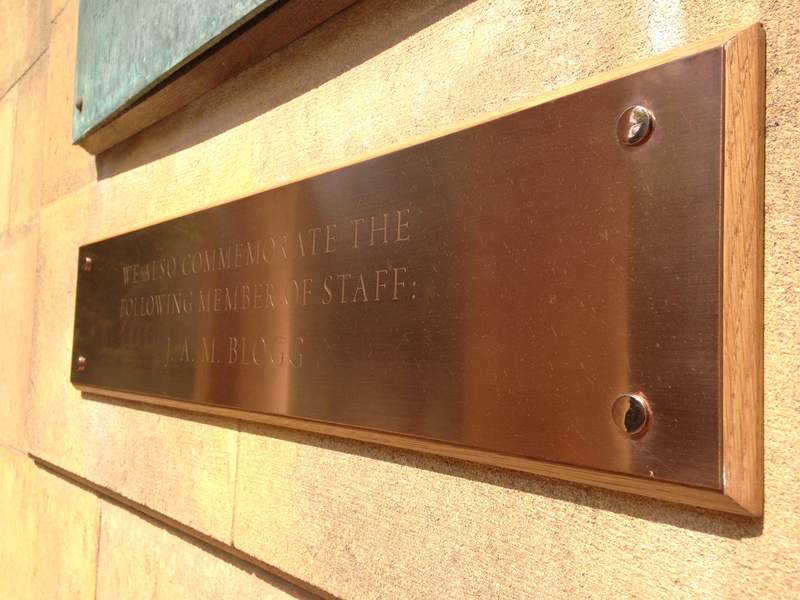 In total, 363 members of Downing College (students, Fellows, alumni and staff) served in the war. They served in the forces of fifteen countries and colonies and in most theatres of war across Europe, Africa and at sea. Forty-one of these died and fifty-five were wounded. A Roll of Honour commemorating those who died is now online. 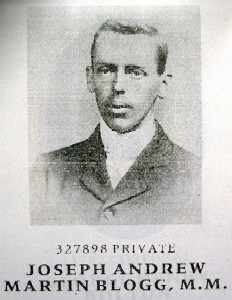 At the Remembrance Service on 11 November 2018, exactly 100 years after the end of the First World War, a new plaque was unveiled to commemorate Joseph Andrew Martin Blogg, a member of staff who died during the war. The majority of records relating to the First World War are open to researchers, by appointment. The previous Archivist mounted a large exhibition on the war several years ago and compiled a full list of all Downing men who served. A new major exhibition was unveiled for the Remembrance Service in November 2018 to mark the centenary of the end of the war. (Available to view by appointment for external visitors). 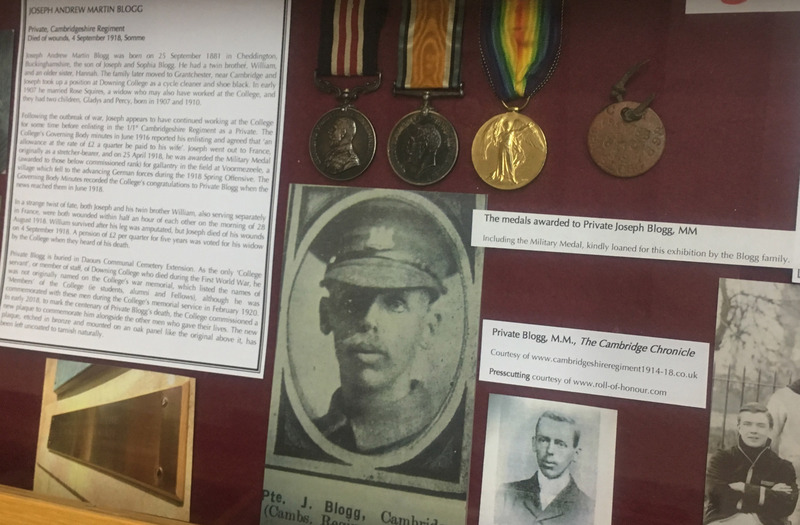 Private Blogg's war medals and tag were kindly loaned by his family for the exhibition. Anyone with a particular interest in Downing during the First World War, or a particular individual, would be welcome to contact the Archivist for further information. The University of Cambridge has produced a short film on the history of the First Eastern General Hospital, which can be viewed here. Downing alumnus and Honorary Fellow, George Wherry, was Lieutenant-Colonel and Surgeon at the Hospital throughout the war. The catalogue of his papers, deposited with the College Archive, can be searched here. The Downing College Association has published a history of 'Downing and the Two World Wars' (2010) by Gwyn Bevan, John Hicks and Peter Thomson. This can be ordered direct from the Association, further details here. Download an information sheet on Downing and the outbreak of war.